An agent stations himself on a hill that overlooks a huge area of desert west of Tucson. He is looking for groups of suspected illegal immigrants. IN THE ARIZONA DESERT - They work in the shadows. They hide in the hills, crouch under shrubs and lie waiting in holes in the ground. They are federal agents from the mobile tactical operations unit of the U.S. Border Patrol, called BORTAC, and their latest mission has brought them into Tucson's back yard. BORTAC has been deployed to work with border police in Albania, Guatemala, Bolivia and Honduras. In the United States, the unit participates in tracking terrorism, riot control, guarding foreign diplomats and catching human smugglers and drug traffickers, Unit Commander Kevin Oaks said in an interview from BORTAC headquarter in Texas last week. The agents represent almost every state in the country and have been operating as a well-kept secret for almost 20 years. Their most notable assignment - and the one that shattered their shield of anonymity - came in April 2000, when BORTAC agents executed a raid to ensure the safe return of Elian Gonzalez to his father in Cuba. A battle to keep the boy in the United States failed. He had been rescued off the coast of Florida when a boatload of Cuban refugees perished at sea. "We keep a low profile and we like it that way," Oaks says. And so an invitation to the Tucson Citizen to observe the work of BORTAC agents came with restrictions, namely that their location and identities not be revealed. The agents were deployed from Biggs Army Air Field in Texas into the Arizona desert this summer by the Department of Homeland Security. A BORTAC agent readies himself for a 12-hour shift in the desert. Their mission: Detect and deter the flow of illegal immigration and drug smuggling. "Our forte is once we leave the pavement," Oaks says. The self-contained operation was set up in tents in the desert within 12 hours of BORTAC's arrival in July. In the first week, agents had apprehended 1,500 illegal immigrants and drug smugglers, according to the unit's supervisor, Agent Jim, 45. They complement routine patrols with tactics designed to create the impression that they are always lying in wait. As of last week, BORTAC agents had apprehended more than 7,800 people in the desert since the operation began, he said. David Aguilar, chief patrol agent of the Tucson sector, called BORTAC an effective resource for border security. "They can be anywhere in the nation within hours," Aguilar says. "They're a self-contained unit that does not tax the sector in any way." Aguilar stressed that BORTAC is but one component of the different missions operating in the desert. They are, he says, the "enforcers" on the border and are supported by, among others, Search and Rescue units and plainclothes agents who follow migrant trails and try to identify and disrupt smuggling operations. A group of suspected illegal immigrants who were caught crossing into the United States from Mexico is watched over by an agent. When U.S. Customs and Border Protection Commissioner Robert C. Bonner launched Operation Desert Safeguard this summer, he stressed that the addition of agents, including BORTAC, into the Arizona desert was a matter of national security. "I must stress, as much as we deplore the loss of life, and we do, as much as we condemn the ruthless human smugglers who put lives at risk in order to make a profit, and we do - the migrants crossing our borders are entering the United States illegally and in violation of our laws," he said in June. "And so, the United States intends to enforce its laws." When the call came about the Arizona mission, agents had less than a week to pack and report to BORTAC headquarters in Texas. "I was on a boat in Cape Cod on July 3 when I got the call," 39-year-old Agent Bobby, from Michigan, recalls. "I was told that I had to be in El Paso on July 5 for training before moving out to Tucson." Their home in the desert consists of cots lined up in militarylike barracks, a couple of trailers and a tent "lounge" with a television set, complete with "rabbit ears," that gets reception from only one Tucson channel. 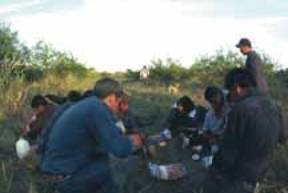 Meals are mostly ready-to-eat packets that can be consumed on the go, unless agents want to make the long journey into the nearest town to buy a meal. Their packs are heavy, weighing up to 100 pounds, and are equipped with everything an agent might need should a shift unexpectedly extend into days. The medically trained agents are also prepared to switch from law enforcement mode into humanitarian mode should they encounter a migrant in distress. Oftentimes, their "lay-in" operations, where they find an observation spot, stay put and monitor desert movement, can last days. "That's probably the biggest difference between BORTAC and other agents - we're willing to work four days straight," says Agent Bobby, an 11-year veteran of the Border Patrol. BORTAC agents search for fresh footprints of suspected illegal immigrants at sundown. They are trying to determine how many are in the group and which way they are traveling through the desert west of Tucson. BORTAC'S work is precise and calculated. These agents use their extensive training to detect groups of people crossing the border, keep them from getting too spread out, and manage their movement in order to get them to walk right into agents who are lying in wait in the cover of darkness. "We like to call it the 'Surprise' operation," says Agent Bob, 41, a 20-year Border Patrol veteran. "Often we succeed in getting them to walk right into our agents or step on (agents) who are laying on the ground." On a recent operation, agents find suspicious-looking footprints across a sandy trail. Clearly, the smuggler leading this group knows that agents will be looking for footprints and he has the group walk heel-to-toe across the trail and carefully step in each others footprints. The race is on and agents don't know if they will encounter work-seeking migrants or a more sinister group trying to smuggle drugs into the United States. Three agents take off into the pitch-black desert on foot. By making their presence known, they strategically "push" the group to travel down a path that will lead them to other agents hidden in the desert, where they will be apprehended. On the next road north, agents sit quietly, watching through night-vision binoculars for signs of the group. Atop a nearby hill, an agent equipped with infrared lenses watches for movement and reports to the others on the ground whenever a group changes direction or stops. This particular night, BORTAC agents are tracking three different groups. 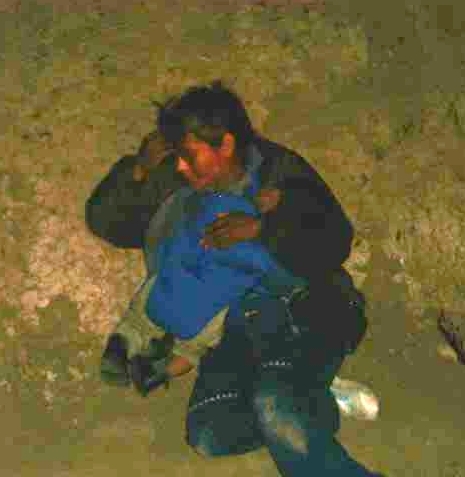 One of the groups apprehended consists of 12 men and two women from Oaxaca. "We're here out of necessity," says Francisca Beltran Lopez, 45. BORTAC agents live a Spartan life. One of the shelters where agents live and sleep while on assignment west of Tucson. BELOW RIGHT: An agent hangs some wash out to dry. She says her group was dropped off and told to walk through the desert and someone else would pick them up once they got out of the Border Patrol's "hot spots." No such luck on this night, as Beltran was one of 43 migrants picked up by BORTAC agents before their shift ended. That strategy, Aguilar says, is what makes BORTAC unique. "Once they get to a certain point, (illegal immigrants) may think they're home free, but really their movement is completely controlled," he says. "We are a blocking force," says Agent Bob, also from Michigan. "We want them to get used to not crossing in this area. We want them to return and tell others, 'Don't cross. (Agents) are everywhere.'" BORTAC agents use marked and unmarked vehicles, off-road bikes, but mainly "good old-fashioned foot power," Agent Bob says. Their shifts are long and the accommodations sparse, but the men of this unit say the job is its own reward. "When you sign up for something like this, it's because you want to be here," says Agent Duke, 32, who has been a Border Patrol agent for six years in Texas. "The lay-ins, being out in the brush and racing in the darkness gets your heart pumping,"
A BORTAC agent searches through garbage in an abandoned house frequented by smugglers and illegal immigrants near Sells. And even though they are more of a law-and-order operation, agents say they understand what drives migrants across the border. "They've got nothing on the their side and everything on the other side," Agent Bob says. "They've got nothing to lose." The most frustrating part of the mission since their arrival has been the routine discovery of dead bodies, agents say. "Whatever your politics are, you don't want people dying out there," says Agent Bob. "It just ain't right." Downtime at base camp revolves around working out with weights in order to stay in top shape, eating meals and teasingly comparing notes of each team's success that day. After each shift, agents meet with an intelligence officer who tracks the movement of trails and volume of activity coming across the border and dictates where agents will go the following day. But no amount of the so-called "intel" can solve the mystery that has agents scratching their heads back at base camp. Alongside the good-quality "guy movies" sits a copy of the movie "My Big Fat Greek Wedding." "Someone snuck it into camp, but nobody will admit it," Agent Duke says, then quickly adds, "And I haven't watched it." A Cochise County group that patrols the border for illegal aliens is preparing to set up a similar organization to do the job in Yuma County. 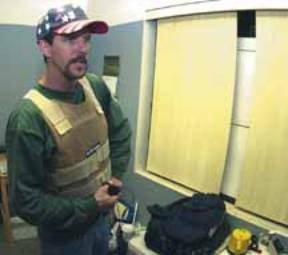 Chris Simcox, leader of the Civil Homeland Defense group, attaches a two-way radio to his pants and over his bulletproof vest, in preparation for a patrol of the Cochise County border with Mexico. Sun photo by Louie Villalobos. COCHISE COUNTY � On Aug. 29, 13 illegal immigrants were stopped minutes after entering the United States by way of federal land located along southeastern Arizona's border with Mexico. The group was asked to sit down, offered water and first aid and told to wait while U.S. Border Patrol agents were called to pick them up. Thinking they were already in the custody of agents, everyone in the group complied. After being told they were being detained by a group of citizens who regularly patrol the border in an attempt to assist Border Patrol agents, one man in the group said listening to the citizens was a better idea than challenging them. "I saw the guns they have," he said. "So we just listened." What the man didn't know, and what the group of citizens want everyone to know, is that they had no intention of chasing anyone in the group and haven't pulled their weapons on any of the more than 1,600 illegal immigrants they have turned over to Border Patrol agents this year. Instead, members of the Civil Homeland Defense group said their mission is to find groups of illegal immigrants, ask them to stay put and call in the agents. It's a mission they are planning to bring to Yuma County and one they said is being requested by up to 100 local residents who are tired of the constant flow of illegal immigrants through the county. "You can do this," said Chris Simcox, president of the Civil Homeland Defense group. "And you can do it without being violent." The Sun recently spent some time with Simcox and his group as they patrolled U.S. Bureau of Land Management land, which he said is leased to a private citizen, near the community of Palominas, Ariz., to see exactly what kind of activity the Civil Homeland Defense will bring to the Yuma area. Simcox said he is planning to officially announce his group's arrival by mid-September and said groups will be patrolling the Yuma border by October, saying the Yuma group will eventually work independently of his. "We are going to give them our model," Simcox said. "Then it will be up to them." Simcox's model for patrolling the border includes the use of night-vision goggles, walkie-talkies, first-aid equipment and water � and carrying a handgun. It also includes offering illegal immigrants first aid, water and food if they need it and allowing those who choose to run away to do so without being pursued. Just after 5:30 p.m. on Aug. 29, five volunteer members of the Civil Homeland Defense headed into the desert in southern Cochise County. Before doing so, though, they met in a small building used as their headquarters and discussed what the night might bring. Simcox reminded the group to be careful in the field and to stay a safe distance away from any illegal immigrants they might find. Less than half an hour later, Carmen Mercer took to heart both those nuggets of advice when she was startled by the group of 13 illegal immigrants she found walking through the desert. Mercer used her radio to alert the rest of the group to the find, and Simcox, who was about 20 yards west of her, took off running. "They already have a group," Simcox said while sprinting through shrubs. Upon arriving, Simcox looked the group over, asked if they needed water and then continued south, where he located and radioed in the location of a second group of immigrants. In the hour and a half it took Border Patrol agents to arrive, the illegal immigrants were allowed to eat the food they were carrying, urinate and stretch their feet. A man in the group was also given iodine to treat ant bites. Many in the group of illegal immigrants asked why they were being detained and if they could just be let go. When Simcox reported seeing a second group walking north, a man in the group being detained offered up the second group as a sacrifice. "See," he said, "they can let us go and get them, instead. We just want to work." Mercer and Cindy Kolb, another member of Civil Homeland Defense, both laughed at the plea bargain being offered by the man, who said he was heading to Kentucky to find work. Because several immigrant rights groups are currently campaigning against Civil Homeland Defense, Kolb made sure to record everything that happened before agents arrived, something Simcox said was insurance in case a criminal complaint is ever filed against him. After several calls to the Border Patrol and an increased sense of nervousness on the part of the Civil Homeland Defense members, the illegal immigrants were asked to walk to a more open area, where agents eventually picked them up and asked members of the volunteer group if they had seen any other activity. Simcox stayed on patrol until after 9 p.m. but decided to call it a night when he noticed an increased presence of Border Patrol agents in the area immediately after agents took the 13 illegal immigrants into custody. Before then, no agents had been spotted patrolling the area. "It happens every time," Simcox said of the agents showing up in force after being given the group of illegal immigrants. "That's OK, though, it means they are doing their job and that's all we want." Louie Villalobos can be r eached at lvillalobos@yumasun.com or 539-6858. SOMERTON � Sitting inside a south county restaurant recently, a group of Yuma County officials and residents gathered to discuss a topic that has them both worried and angered: the arrival of a citizen's group that will patrol the county's border with Mexico in search of illegal immigrants. In the room was a state representative, a staff member of a U.S. congressman, a local mayor, a land developer and several residents. All had the same message for Chris Simcox and his Civil Homeland Defense group. "We do not want these people here," said Nieves Riedel, owner of Riedel Construction in San Luis, Ariz. "They should let the Border Patrol do their job." Simcox has promised to bring his group to Yuma County within a week to train locals to patrol Yuma County's border with Mexico by October. His group, Civil Homeland Defense, currently patrols Cochise County's border with Mexico and has turned over more than 1,600 illegal immigrants to U.S. Border Patrol agents, he said. But that kind of activity is not welcome in southern Yuma County and will be met with protest, the restaurant gathering said. Also concerned about Simcox is a Tucson-area immigrant rights group, which recently launched a binational campaign to search out illegal immigrants who have had their rights violated by any of the three citizens groups patrolling the Tucson area. Jennifer Allen, director of The Border Action Network, said Yuma-area residents should be concerned with Simcox's plans and should make their concerns known to state and county officials. "Put signs in businesses," she said. "Make it very visible and public that these sorts of individuals and activity will not be tolerated in the community." Allen said the search for illegal immigrants who have been physically assaulted by any of the groups patrolling in Cochise County has turned up nothing so far. Carol Capas, public information officer for the Cochise County Sheriff's Office, said the department hasn't had any complaints by illegal immigrants regarding the civilian patrols, adding officers interview every illegal immigrant detained by citizens. That fact, Simcox said, means what his group is doing is not only legal, but humane. "If we catch anyone harassing or abusing any migrants, I would arrest them on the spot," he said. "Because that is not what this is about." Back in the Somerton restaurant, Luis Heredia, who runs the Yuma office for U.S. Rep. Raul Grijalva, said what Simcox's group is about is racism toward Hispanics. Somerton Mayor Agustin Tumbaga and state Rep. Amanda Aguirre, of Yuma, said they will work against Simcox's group. Among the responses being considered is asking local officials to take a stance against Simcox and enlisting the help of pro-immigrants groups, such as Allen's. Nena Garcia, a citizen of Gadsden, said residents there are worried that Simcox's group will mistake residents for illegal immigrants because of the high number of Hispanics living in the area. She said the community is already rampant with illegal immigrant activity and residents are already fearful for their safety. They don't need armed citizens adding to their fear, she said. "Does that mean we are going to have to have our citizenship with us at all times, just for the sake of these people?" she asked. "And do we have to answer to them?" Simcox said the Yuma-area residents who want to stop illegal immigration should consider patrolling the border area east of San Luis, Ariz., where there are no residents, as apposed to the Gadsden-San Luis area, which has a border with Mexico that is lined with residents. The main thing for residents to know, he said, is that his group doesn't automatically pull their weapons and doesn't harm illegal immigrants in any way. For residents wanting to take part in the patrols, Simcox said they should know it is perfectly legal to do so. Louie Villalobos can be reached at lvillalobos@yumasun.com or 539-6858. A Bureau of Immigration and Customs Enforcement�s Tucson Air�� Blackhawk helicopter responded to a call for assistance from Civil Homeland Defense Friday night as the volunteer citizen border watch group encountered 15 illegal aliens hiding in a wash near the San Pedro River. �� With rain showers and cloud cover bringing temperatures below the 100-degree mark, border crossings have been intense during the past week. Friday, July 18, Civil Homeland Defense volunteers were involved in a late afternoon search and rescue patrol in an area near the San Pedro River when a report of Border Patrol Agents coming under gunfire as was heard over radio transmissions. Agents were near the border just East of Palominas in the same vicinity as the CHD Patrol. Within thirty minutes volunteers encountered three young males who carried no water in the remote area. The suspected illegal immigrants refused water and ran from volunteers despite pleas for them to stop. Border Patrol was notified and agents continued the pursuit. �� Approximately thirty minutes later CHD members found twelve adults and three children huddled in a wash. Border Patrol was notified and dispatched a Tucson Air Blackhawk helicopter to assist in the rescue. �� Later the same evening volunteers encountered a group of 25 illegal aliens being led through the same area by a coyote smuggler. The group was also from Pueblo, Mexico. Five young children were found traveling with the group.� They were almost entirely out of water and food and two illegal entrants required medical attention. During the hour wait for Border Patrol to arrive the group consumed five gallons of water provided by CHD volunteers. �� During three days of patrols Civil Homeland Defense volunteers assisted Border Patrol with 69 apprehensions including three coyote smugglers. Volunteers are needed for expanded search and rescue patrols in an effort to prevent more deaths in Cochise County, which now stand at 31 since January 1, 2003. To date CHD volunteers have turned over 1,405 illegal aliens to Border Patrol without incident. �Civil Homeland Defense informational meetings are held every Wednesday night, 7 p.m. at the O.K. Caf�, Third and Allen Streets in Tombstone. For more information contact Chris Simcox 520-457-3008. � Randy Graf, a Republican who represents District 30 in the Arizona House of Representatives, is confident that a proposed initiative to do nothing more than follow the law will win by a landslide.� The peoples� initiative is causing an initial knee jerk, negative reaction that is already drawing the expected �racist and anti-immigrant� name calling from the open border proponents. �Democrats will do political grandstanding and name-calling,� said Graf, who is his party�s majority whip in the state House of Representatives. �� The initiative means to enforce laws already on the books in 31 states, and is not getting support from governor Napolitano and even the Arizona Republican Party leadership. The state�s GOP congressional delegation won�t support the initiative brought by the citizens of Arizona. The initiative will require people to prove citizenship to be able to vote and ensure non-U.S. citizens do not obtain unauthorized benefits. I am more than confident it will be passed by voters next year, and I personally will work to ensure it does. �� The initiative is not changing Arizona�s Constitution, but it would change parts of two state statutes to strengthen the Constitution regarding the registration of voters. There is nothing wrong with citizens demanding that only citizens are voting in elections and obtaining benefits paid for by taxpayers. �� The statute regarding voter registration already requires the state or country of birth to be provided and would add a requirement that applicants submit proof of U.S. citizenship and provide the ways it can be done in order for a voter to be registered. Makes sense to me. � �The state�s Constitution requires a person to be a citizen of the nation and state, and statutes are enacted to provide how voters are registered,� Randy Graf said at last week�s meeting. And what the hell is wrong with that? This is the most common sense approach to upholding our Constitutional cannons that I could ever think of. Thirty-one other states feel this is important and they require the same proof of citizenship; does anyone call those state governments or citizens racists? �� �We are not violating any law. We are not violating anybody�s constitutional rights,� Graf said, adding that the requirement is for all people who register in the state and is not race based. �It applies to everyone.�� Gee you mean something like the fourteenth amendment that guarantees equal protection for everyone? �� There are many idiots who think the initiative is designed to take voting rights away from minority groups, especially Hispanics. What do they mean?� Do they advocate breaking the law?� Do they advocate having people from another country voting in our elections?� I wonder--if Governor Napolitano is against the initiative, then is she involved in pandering for illegal votes?� Were the illegal voters the only reason she won the election in the first place?� Of course she won�t support the initiative because it would mean she would lose her voting base during the next election cycle. � Part of the initiative is to ensure people seeking some benefits, such as health care or welfare, are authorized to have them and it�s about time. I�m sick enough of paying for fat, lazy, apathetic American citizens and I sure won�t support paying for people from another country who have entered our nation illegally. � We have the petitions in the Tumbleweed office. Stop by and read the initiative in its entirety and sign the petition.� If you are not yet a registered voter we have voter registration forms and we�ll get you signed up. It�s about time we get back to the rule of law in this country. I read in an Associated Press story that the government of Mexico has amended its Constitution to allow migrants, most of whom are in the United States illegally, to vote and even run as candidates in Mexican elections while in the United States. Show up at your local Mexican consulate office and vote for your party�s candidate while taking jobs from Americans; One World IS Enough For ALL OF US? �This law serves to recognize the political rights of migrants,� said Zacatecas Gov. Ricardo Monreal. Now how about this unbelievable fact from the story: �There are about 1.5 million Zacatecans, half of the state�s population, spread across 20 U.S. states.� And most are� here illegally! Border Patrol should surround every Mexican consulate office in this country; the agency should be required to interview every person who shows up for a matricular consular I.D. card. And B.I.C.E. should immediately deport every person who cannot prove legal residence. That would be called upholding the rule of law? Ah, but American Idol and The Osbornes are more important than rule of law. �Speaking of rule of law, I see Arizona Gov. Napolitano is in Mexico working out a deal to allow more� Mexican citizen workers to take American jobs. Remember, guest worker means the visitor should first have to be invited, then,� when it�s time, they return home.� The employer is the invitee, and they should be held accountable for providing the visitors with a couch to sleep on, feed them, entertain them and take care of their medical care during their visit here, which is supposedly because they want to work. Then, when it�s time, the employer should make sure they return home safely and without costing the American taxpayer one red cent. �Nappy has also had some strong words for the �vigilantes� running rampant on the border. First she says the groups are not as powerful or widespread as people think and they have no political power. Oh really? Then why are you even talking about them Nappy? And you know in some ways Nappy is right. Civil Homeland Defense has been patrolling the bprder for over a year now and I�ll have to admit,� after over 150 patrols to assist Border Patrol,� we have never run into any vigilantes on the border! Can�t find them anywhere! Guess Nappy is correct about there not being that many of them, I think they are about as rare as the leprechaun guarding the pot of gold at the end of the rainbow - I agree, they are just a figment of the media�s imagination. �� And I�ll tell you what Nappy, if we ever run across anyone out in our neighborhood abusing illegal migrants or even taking advantage of a member of Al-Quaeda, I will personally make a citizen�s arrest of the perpetrators and bring them directly to your doorstep if you want us to.� There is no place for abusive vigilantism.� I wonder if tarring and feathering politicians is considered vigilantism? �There are however, over a hundred people in the Yuma area who will be attending a meeting in September to learn how to create their own version of Civil Homeland Defense. Their actions are in direct reaction to your cowardice and abandonment of the Constitution you took an oath to uphold. Sounds like Nappy may be in the sights of a citizen recall just like the one in California. Time for us to fight back with our votes, Nappy - that�s the American way. � Enough is Enough! Time is here for a recall of every elected official who refuses to protect our borders! of the city. Who is this governor working for? Simcox has experienced national media attention in the last three months, based upon his stand against illegal border-crossers and his call for closing the U.S. borders to protect national security. I had spoken to Chief Ranger Weigand on the phone Monday to set up the interview for the following day, and asked if Ranger Deborah Girard would be available for comment, and he stated that it was her day off. Based upon her report, he would be happy to fill me in on what had transpired on Sunday, January 26, 2003. �We began at the beginning. It was about 2:30 p.m, and Deborah was out in the field, monitoring the area which he described as the Montezuma Ranch, around the south-east boundry.� There she encountered three individuals, two of whom had opened a gate and entered the Park on foot. I asked Chief Ranger Weigand how long the two individuals were detained (the person outside the gate was presumably not involved in the incident), and he answered, �Approximately three hours.� He further explained this duration of time as being devoted to �waiting for back-up, writing citations, itemizing confiscated items (including 2 two-way radios, a scanner, a cell phone, a camera, and a pistol), other paperwork, and transporting suspects to the Park compound.� I inquired about the motives of Simcox and of the other suspect, Bill Dore, who lives in Douglas; the Chief Ranger responded immediately. �They had papers on them��plans of operation� for the Civil Homeland Defense, a mission statement for the Civil Homeland Defense with letterheads.�� These papers, combined with the location at which they were encountered, and the� �tools� which they were carrying (i.e., cell phone, two-way radios, etc. ), are, he stated, �evidence that they were conducting a manhunt on Federal lands� without� a permit. �What kind of permit is required?� I asked him. He informed me that� this type of permit encompassed a number of possible uses, among them being the apprehension of illegals, the monitoring of visitor use activity, and scientific research. He added that Mr. Simcox and his group would need to have a permit� to conduct Civil Homeland Defense activities on Coronado Memorial lands. Thus, Chris Simcox and Bill Dore were issued citations by Officer #1010, Ranger Deborah Girard, for failing to obtain� permits(36 CFR 1.6). Bill Dore had a portable radio but was not armed. My next question was about signage�were there signs posted in the area where the suspects entered? �Oh, yes,� the Chief Ranger replied. �As a matter of fact�� he stood up to retrieve a sample sign from the top of a nearby shelf. �These signs are posted every few feet along the fence line.� The sign he showed me was a green and white metal rectangle about 12 inches by 6 inches, with a message announcing the boundary of Park lands. I traveled back to Tombstone, the Town Too Tough To Die, for an interview with Chris Simcox. The meeting revealed another window on the situation. Chris was at his desk writing checks as I settled into a chair with my notebook and pen. Driving down a border road near Coronado Monument, Simcox and Dore met Henry Harvey, former Tombstone resident, also retired, and a member of the American Border Patrol, another citizens� group which monitors illegal activity along the U.S-Mexico line. A few minutes later, a Border Patrol van passed by, and the officer waved, then stopped to talk with the other three men. Simcox told Harvey and the Border Patrol officer that he and Dore were planning to hike up past the gate, as there was a trail that he had observed on Saturday, and he wanted to see where it went. �Were there any other signs around the area?� I asked. �No. The only sign was the �No Vehicles� sign on the gate,� he repeated. Simcox and Dore then entered through the gate, leaving their vehicle parked on the road. Simcox related that they walked about twenty paces into the gated area when he (Simcox) realized that he had forgotten to bring his walking stick. Thinking it might come in handy on a steep trail, Simcox began jogging back toward the gate to retrieve the stick from the parked vehicle. It was then he was stopped short by a female voice. �Stop right there and drop your backpack. We both know what�s in it.�� The voice continued. Henry Harvey, who was still in the area, walked up to the fence and began taking photographs. The ranger demanded that he stop taking pictures, and ordered him to open the gate and come into the area to submit to a search along with Simcox and Dore. Harvey declined the order. �I feel as though we are being harassed,� Simcox told her. �Are there any weapons in your backpack?� the ranger wanted to know. �I have been watching you, and you have no right to be in this area,� she continued. �We are not doing anything wrong,� Simcox answered. �I was out yesterday, looking through binoculars, patrolling the area, as the President of the United States has encouraged us to do�� Simcox retorted. Simcox told me his story, complete with dialogue, as he turned pages of a small note pad on which he had scrawled notes to himself about what took place during this particular Sunday afternoon. My pen could barely keep up as he verbalized quote after quote. It was then the ranger pulled Simcox�s shirt up to reveal a .45 pistol. According to Simcox, he and Dore were instructed by the ranger to walk a distance of about a mile to where her truck was parked, and ordered to sit down on the ground. Within 10 minutes the Border Patrol arrived, with lights flashing, and soon after that two more Park rangers pulled up, also with lights flashing. Simcox believes it was about a� 45 minute period during which Border Patrol officers and Park rangers, totalling seven officials and seven vehicles, talked among themselves while Dore and Simcox remained sitting on the ground. Simcox said they were never offered water and never read their Miranda Rights.� Then Ranger Rene Gonzales approached, and told the men they would� be thoroughly searched. Simcox told me about what he termed �a criminal search��he and Dore were made to empty all their pockets, remove their belts, and open their backpacks, after which the two were cited, then transported for further questioning. Simcox showed me the three violation notices he had received: the first for no permits, the second for carrying a loaded weapon on park lands, and the third for disorderly conduct and providing false information. He confirmed items which were confiscated for evidence to be: a cell phone, 2 two-way radios, a scanner, a camera, and a .45 pistol. Some papers which were in his backpack were also kept for evidence: a folder containing Border Patrol contact phone numbers (Naco and Douglas), plus a blank Civil Homeland Defense report form left over from the Saturday patrol. He commented that Ranger Gonzales, who was new to the area, had reportedly worked cooperatively with the American Border Patrol to recently detain eight illegals. My next order of business was to call Bill Dore in Douglas to see what his take was on Super Bowl Sunday.� Bill is man in his sixties, a retired computer hardware engineer and concerned citizen on border issues.� In a fifteen minute telephone interview, Bill recalled the events of that afternoon. �We were out on Sunday, not to patrol, but just exploring,� he explained. He told of how he and Simcox drove down the border road and met a friend, Henry Harvey, who is associated with the American Border Patrol group, and talked with a Border Patrol officer, also a friend, telling him of their plans to hike up the mountain and find a trail. The officer said they could go through �the cowboy gate� on foot, but that no vehicles are allowed up there. When questioned, Dore stated that Simcox did not run from the ranger. He chuckled, and added, �Any one who knows Chris� would know he didn�t run. The woman asked Chris if he had a gun in his backpack, and he replied that he did not. She discovered Chris� .45 pistol in his belt, and immediately unholstered her gun and pointed it at Chris. Dore stated that he and Chris were ordered to the ground on their hands and knees. The woman then took the gun from Chris and asked Dore if he had a weapon as well. He answered that he did not. He further stated that this woman had Chris� gun in her right hand, aimed at Dore, and Dore asked her to please not wave it around and please aim it in another direction. She reportedly then put the gun on the ground and put her foot on it. Dore recalled being ordered to walk about a mile north to Deborah Girard�s truck, where he and Chris sat on the ground while calls were made and other rangers and Border Patrol officers arrived. He said they both sat for a very long time while rangers and officers talked the situation over, then told them they would be searched. My final interview, was with Henry Harvey. He agreed to speak about Sunday, the 26th, in a phone interview. Henry is a retired city clerk who used to live in Tombstone. As a member of the American Border Patrol, Mr. Harvey works to assist other groups such as the Civil Homeland Defense Corps in a common effort to enhance security along our southern borders. Henry Harvey� said that he met Chris Simcox and William Dore on the border road that afternoon. Simcox and Dore were headed up the hill to find and hike a trail Simcox had seen the previous day. I asked him about the signs. Were any signs posted� giving information about the demarcation into Park lands? Harvey watched as the ranger emerged. He said that she must have been �staked-out up the road.� She made her approach �walking fast� toward Simcox and Dore. He stated that he watched Simcox and Dore pull out their I.D.�s to show the ranger upon her request. According to Harvey, Chris was also very clear about identifying himself as a Civil Homeland Defense Corps member. Harvey also heard the ranger use the word �arrest� as she confronted the two men.